"Our proposals for the beginning of the discussion were accepted with satisfaction." 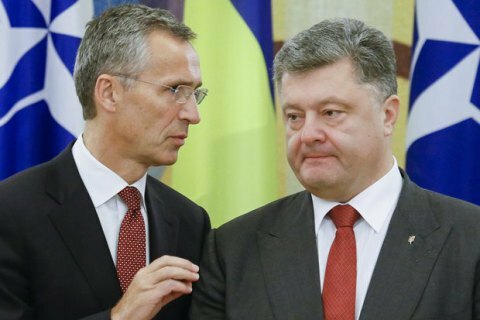 Poroshenko and Stoltenberg during a meeting in Kyiv, September 22, 2015. Ukraine initiated a discussion on the receipt of the Action Plan on NATO membership, President Petro Poroshenko told reporters after talks with the NATO Secretary General on 10 July. "Ukraine has determined its political future in the matter of security. The Verkhovna Rada voted, and I, as president and supreme commander in chief, signed a law that sets forth our future membership in NATO as the goal of our international policy. We consider it necessary to begin a discussion about the introduction of the Membership Action Plan," he said and went on to say that Ukraine's proposals on the beginning of the discussion were "accepted with satisfaction". At the same time, Poroshenko admitted that Ukraine does not yet meet NATO standards, so it is too early to talk about accession to the Alliance. Ukraine wanted to receive the MAP in 2008 at the NATO summit in Bucharest but this decision was blocked by Germany and France. In 2014, Russia attacked Ukraine. NATO has several partnership programs that precede full membership in the organization: Partnership for Peace, Individual Partnership Plan, Accelerated Dialogue, and Membership Action Plan. The North Atlantic Treaty provides for the need for the consent of all NATO members for a new country to join the Alliance.